BCF : Can Christian/Hindu/ Buddhist Soldiers in Malaysia openly display symbols of their religious affiliation? Just asking. A Muslim soldier who filed a complaint alleging that her religious freedom was violated when she was forced to remove her hijab now intends to file a federal lawsuit against the U.S. Army. “I want to let people know that’s it’s not a bad thing to stand up for yourself when you’re getting mistreated,” Sgt. Cesilia Valdovinos, 26, tells Yahoo Lifestyle. I hear comments that I’m the reason why 9/11 happened,” says Valdovinos, who converted to Islam in March 2016. 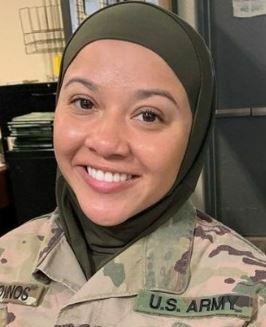 “There’s a lot of anger and animosity.” She claims that her breaking point came while she was attending a suicide-prevention briefing with the 704th Brigade Support Battalion at a chapel in Ft. Carson, Colo.
That, she says, is when her command sergeant major allegedly grabbed her arm, pulled her out of rank and forced her to remove her hijab in front of her colleagues.